The Vickers Group, led by Group Leader Associate Professor Claudia Vickers, applies synthetic biology approaches to answer key fundamental biological questions and to develop/improve industrial bio-processes. In particular, they are interested in using biology to replace current industrial practices (largely based on finite petrochemical resources) with sustainable, environmentally friendly processes. To this end, they use the tools of systems and synthetic biology for metabolic engineering of organisms. Metabolic engineering is the rational redesign of organisms for production of specific industrially-useful compounds. The Group is particularly interested in a large group of natural products called isoprenoids. Isoprenoids have many different biological functions, and they also have a multitude of biotechnological applications (e.g. biofuels, agricultural chemicals, flavours, fragrances, pharmaceuticals, and food additives). The Vickers group currently works in yeast (Saccharomyces cerevisiae), Escherichia coli, cyanobacteria (Synechocystis and Synechococcus spp. ), Pseudomonas putida, and plants (various species). These diverse areas are linked though application of synthetic biology to understand fundamental biology, and applying this understanding to industrial bioprocesses. The group is experienced in working closely with colleagues in other disciplines and with a wide range companies interested in pursuing emerging opportunities in these fields. Peng, B.; Williams, T.C. ; Henry, M.; Nielsen, L.K. ; Vickers, C.E. * (2015) Controlling heterologous gene expression in yeast cell factories on different carbon substrates and across the diauxic shift: a comparison of yeast promoter activities. Microbial Cell Factories 14:91. Vickers, C.E. *; Sabri, S. (2015) Isoprene. In: Kamm B. (ed.) Biotechnology of Isoprenoids. Advances in Biochemical Engineering/Biotechnology, vol. 148. Springer: Berlin, Heidelberg; pp. 289-317. Vickers, C.E. *; Behrendorff, J.B.Y.H. ; Bongers, M.; Brennan, T.C. R.; Bruschi, M., Nielsen, L.K. 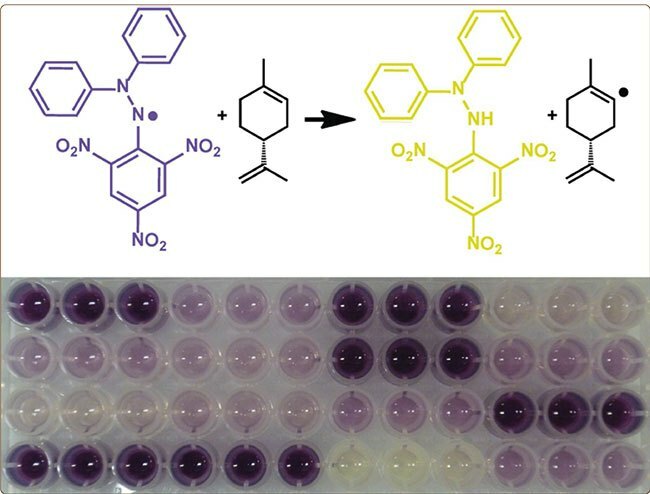 (2015) Production of industrially-relevant isoprenoid compounds in engineered microbes. In: Kamm B. (ed.) Microorganisms in Biorefineries. Microbiology Monographs, vol. 26. Springer: Berlin, Heidelberg; pp. 303-334. Vickers, C.E. *; Bongers, M.; Bydder, S.F. ; Chrysanthopoulos, P.; Hodson, M.P. (2015) Protocols for the Production and Analysis of Isoprenoids in Bacteria and Yeast. In: McGenity, T.J.; Timmis, K.N. ; Nogales, B. (ed.) Hydrocarbon and Lipid Microbiology Protocols, vol. 26. Springer: Berlin, Heidelberg; Ch. 11 pp. 23-52. Behrendorff, J.B.Y.H. ; Vickers, C.E. *; Chrysanthopoulos, P; Nielsen, L.K. (2013) 2,2-Diphenyl-1-picrylhydrazyl as a screening tool for recombinant monoterpene biosynthesis. Microbial Cell Factories 12:76. Open Access; as of 14/08/16, accessed 6046 times since publication (23/08/2013). Williams, T.C. ; Nielsen, L.K. ; Vickers, C.E. * (2013) Engineered quorum-sensing using pheromone-mediated cell-to-cell communication in Saccharomyces cerevisiae. ACS Synthetic Biology 2(3):136-149. One of the 10 most-read articles in ACS Synthetic Biology for Q1, 2013. Sabri, S.; Steen, J.A. ; Bongers, M.; Nielsen, L.K. ; Vickers, C.E. 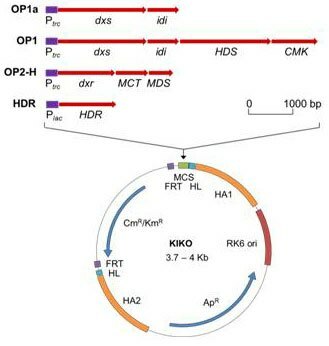 *; (2013) Knock-in/Knock-out (KIKO) vectors for rapid integration of large DNA sequences, including whole metabolic pathways, onto the Escherichia coli chromosome at well-characterised loci. Microbial Cell Factories, 12:60. Open Access; listed as “Highly Accessed”. As of 14/08/15, accessed 12,318 times since publication (24/06/2013). Multiple plasmid requests from researchers across the world. Sabri, S.; Nielsen, L.K. ; Vickers, C.E. * (2013) Molecular control of sucrose utilization in Escherichia coli W, an efficient sucrose-utilizing strain. Applied and Environmental Microbiology 79(2):478-487. Archer, C.T. ; Kim,J.F. ;Jeong, H.; Park,J.H. ; Vickers, C.E. *; Lee, S.Y. ; Nielsen, L. (2011) The genome sequence of coli W ATCC 9637: comparative genome analysis and an improved genome-scale reconstruction of E. coli. BMC Genomics 12:9 Online First DOI:10.1186/1471-2164-12-9. Open Access; as of 14/08/16, accessed 19,451 times since publication; listed as “highly accessed”. Schenk, P.M.*; Vickers, C.E., Manners, J.M. (2003) Rapid cloning of novel genes and promoters for functional analyses. Transgenics 4:151-156. We have developed a variety of synthetic biology tools to facilitate engineering and more general investigation in many different species. All plasmids are available from Addgene here. Software and other tools available at the links in the sections below. 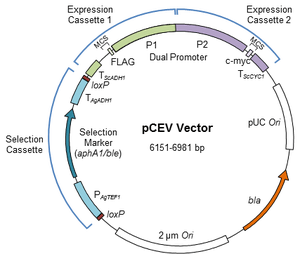 The pCEV vectors allow over-expression of 2-3 genes from one plasmid in yeast using antibiotic resistance for selection. This is particularly useful for industrial strains that do not have engineered auxotrophies, or for heavily engineered strains that have no auxotrophic markers remaining for selection. Genomic integration is also possible. 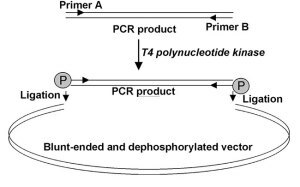 Read the paper and view Figure here, and get the plasmids here. 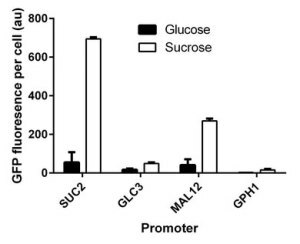 Figure: Sucrose responsive promoters: grow on glucose to increase the biomass then switch to sucrose to initiate gene expression (or repression) – read about the approach and view Figure here, and get the Suc promoter plasmids here. Engineered quorum-sensing using pheromone-mediated cell-to-cell communication in Saccharomyces cerevisiae. Used to trigger gene expression (or repression using RNAi) according to cell density. Read more and view Figure here. Get the plasmids here. 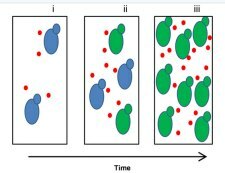 Figure: (i) When S. cerevisiae population density is low, there is insufficient pheromone (red dots) present to induce GFP expression (blue S. cerevisiae). (ii) Pheromone becomes more concentrated as the population grows; at sufficient pheromone concentration, GFP expression is triggered (green S. cerevisiae). (iii) at sufficient pheromone concentration, GFP is induced across the whole population. The RNAi system from S. castelli was imported into S. cerevisiae for gene knock-down. We tested it for shikimate pathway engineering linked to a quorum sensing module and in a sucrose-response-repression system. Circuit topology of engineered S. cerevisiae. 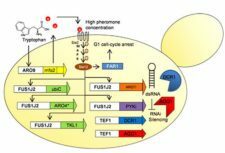 Tryptophan-initiated pheromone quorum sensing, the shikimate pathway, the pheromone responsive FUS1J2promoter and RNAi gene knockout were used to produce high levels of PHBA. See Fig.1b, Williams et al, Metabolic Engineering 29 (2015): 124-134, linked above. Click to enlarge. Dynamic repression of GFP expression using sucrose mediated RNAi. Expression of a hairpin GFP construct is triggered using SUC2 promoter during growth on sucrose, causing GFP expression to be repressed via RNA interference. See Fig.4b, Williams et al, Microbial Cell Factories (2015) 14:43, linked above. Click to enlarge. The KIKO vector series is used for rapid, efficient integration of very large DNA sequences onto the E. coli genome at well-characterised non-essential insertion loci. 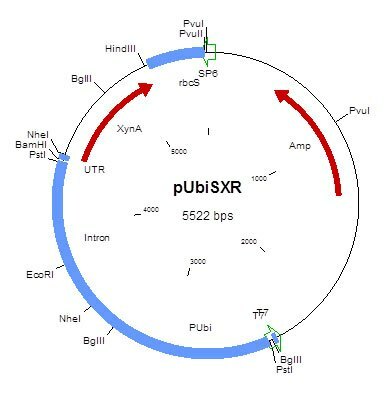 These plasmids are particularly useful for introduction of multiple genes and pathways, for example when reconstructing long metabolic pathways for metabolic engineering applications. Read more here and get the plasmids here. Knock-in/Knock-out (KIKO) vector. Three operons (OP1a, OP1, OP2-H) carrying genes of the MEP pathway, and a single MEP pathway gene (HDR), have been cloned into the multiple cloning site (MCS) for integration into the E. coli genome by homologous recombination. Click to enlarge images. Genome of E. coli MG1655. Shows locations of KIKO non-essential target lociarsB, rbsAR and lacZ. Inset shows bright green fluorescence produced by engineered strain carrying green fluorescent protein (gfp), xylanase (xyn) and sucrose utilization (csc) genes. See Figures 1, 2 and 5 (Sabri et al., 2013) here. Sucrose is a cheap, abundant carbon source – but most lab and industrial strains of E. coli cannot utilise it. We developed a transferable sucrose utilization approach for non-sucrose-utilizing E. coli strains. Read about it here and get the plasmid here. 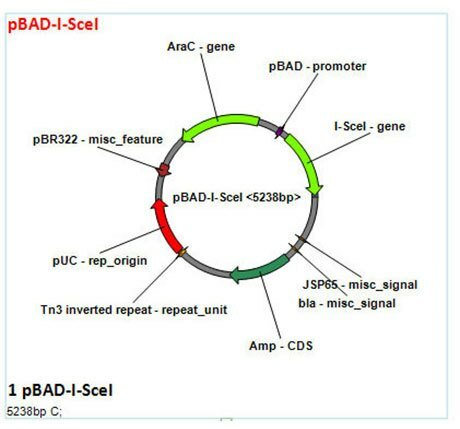 pCSCx plasmid. FRT-CmR-FRT (flippase recognition target, chloramphenical resistance gene) cassette and cscAKB genes were cloned into lacZ gene. TheHomologous Recombination Cassette for transferable sucrose utilization was amplified from this plasmid. HA = homologous arm. We sequenced the genome of a sucrose-utilising E. coli strain and developed an improved genome-scale reconstruction of E. coli. Read more and download tools here. 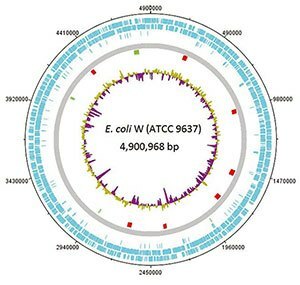 Circular map of E. coli W chromosome. Circles from outside to inside: Outer, position in bp; 2nd, 3rd and 4th (blue), forward ORFs, reverse ORFs and pseudogenes, respectively; 5th (green), pseudoknot; 7th, large mobile elements – phage-like elements (PLEs, green), prophages (red); inner, G+C (purple) and A+T (tan) content. See Fig 1, Archer et al (2011), linked above. pGFPGUSPlus: a dual reporter gene binary vector for plant transformation. Contains cassettes for both GUSPlus and GFP. Useful for developing and improving transformation systems; you can also replace one reporter gene with your gene of interest and use the other reporter to track transformation, do linked segregation studies in progeny, etc. Read more here and get the plasmid here. Strong, endosperm-specific promoters for cereal crops. Can be used for cereal seed improvement and plant bio-factory applications. Read more here and get the plasmids here. The GUSPlus reporter gene driven by the constitutive, ubiquitous ubi promoter. 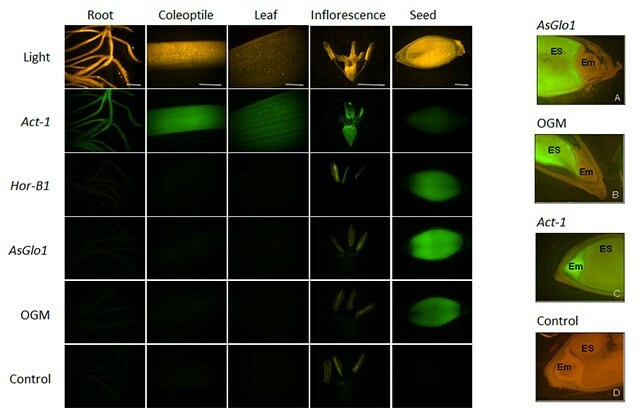 Useful as a reporter gene control for plasmid work in plants. Publication here and get the plasmid here. All-in-one Molecular Cloning and Genetic Engineering Design, Simulation & Management Software for Complex Synthetic Biology and Metabolic Engineering Projects. A fantastic resource for complex synthetic biology and metabolic engineering projects; does all your in-silico design, handles project workflows including experimental notes and flow-on updating, and acts as a project database. And it’s free! Read the paper here and download the software here. sXynA: A synthetic xylanase reporter gene for functional analysis. We tested it in plants but it also works fine in E. coli and probably other organisms – the gene is a fungal gene. 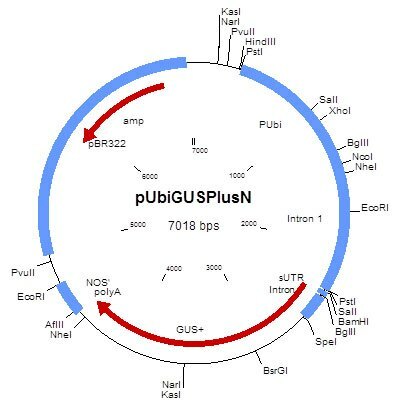 Can be used in conjunction with the GUSPlus reporter gene for promoter analysis here and get the plasmids here. Green fluorescent protein RNAi construct – can be used to knock down GFP conditionally. Currently under the control of a sucrose-responsive promoter in a yeast expression vector (see here for details), but can be sub-cloned into other constructs for your bespoke applications. Get the plasmid here.